Posted in: BSU Journal Club. Tagged: close-in planets, WASP-12 b. (top) WASP-12 b’s orbit. (bottom) The Roche lobe around WASP-12 b.
WASP-12 b is a planet in crisis. One of the hottest of the hot Jupiters, the gas giant circles its Sun-like host star in a blistering 1.09-day orbit, giving its an atmosphere hot enough to vaporize rubies. In fact, WASP-12 b is so close to its star that it very nearly fills its Roche lobe, the teardrop-shaped region inside of which material is bound to the planet. Anything on the other side of the Roche lobe falls into the gravitational clutches of the host star and can either tumble into the star or leave the system altogether. Because WASP-12 b’s atmosphere is so hot, it is very puffy and extended, and a study from several years ago pointed out that some of the atmosphere can probably spill over the Roche lobe and escape the planet. Indeed, several groups have seen indications of outflow from WASP-12 b, meaning the planet is falling apart in front of our eyes. Knowing what happens to the gas after escaping the planet is important for understanding the fate of the planet. If the gas goes into orbit around the star, forming an accretion disk, the planet might have billions of years before it’s destroyed. On the other hand, if the gas quickly escapes from the system or is otherwise prevented from forming a disk, the star’s gravity could rip the planet apart in an astronomical blink-of-an-eye. A recent study from Alex Debrecht and colleagues from University of Rochester Physics and Astronomy explored what happens to gas escaping WASP-12 b. 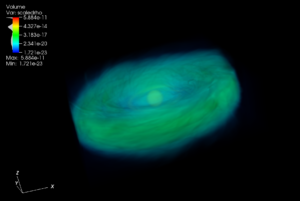 For their study, they constructed hydrodynamic models using the AstroBEAR code and found that a substantial torus of hot gas could build up around the host star in about a decade, potentially enough gas to explain the observations showing some kind of spectral absorption from the system. Such tori may commonly form in systems with ultra-hot Jupiters, so this study is probably relevant to lots of exotic exoplanets. 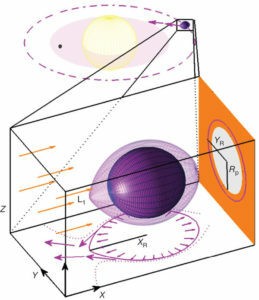 Three-dimensional simulation of gas torus in the WASP-12 system. As interesting as these results are, though, they leave some important issues unaddressed. 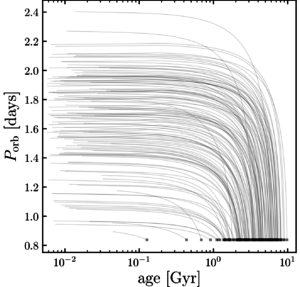 For instance, Debrecht and colleagues didn’t seem to include any accretion onto the host star, which might happen proceed at a fairly high rate. And the balance between outflow from the planet and accretion onto the star will go a long way to determining the amount of material in the accretion disk. And knowing the amount of material in the disk on orbits interior and exterior to the planet’s orbit is critical for understanding the fate of WASP-12 b and other similar ultra-hot Jupiters. The accretion disk can gravitationally tug on the planet – material interior can push the planet out, while material exterior can push the planet in, potentially dooming the planet to rapid disruption. But as is true for even the most seminal scientific work, more research is needed. Posted in: Public Outreach. Tagged: astrobiology, climate change, David Grinspoon. UPDATE (2018 Jun 6) – I’m trying to learn how to use Sphinx to create documentation from source-code docstrings. The Sphinx manual is impressively opaque. Some googling turned up this document, which seems to provide useful details. To set up my package so it can be installed via pip, I’m following the somewhat outdated tutorial here – https://python-packaging.readthedocs.io/en/latest/index.html. I’ll make more notes and update this post as I go along. Posted in: Brian's Presentations. 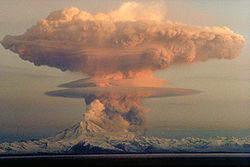 Tagged: dust devils. Ancient software developers meticulously punched holes in paper cards to write programs. In the eons before my graduate career, scientists rarely, if ever, publicly distributed their codes, with authors zealously guarding their coding projects. But just as I was finishing my PhD, it was becoming common for scientists to make the code they developed as part of a published project readily available on the internet. 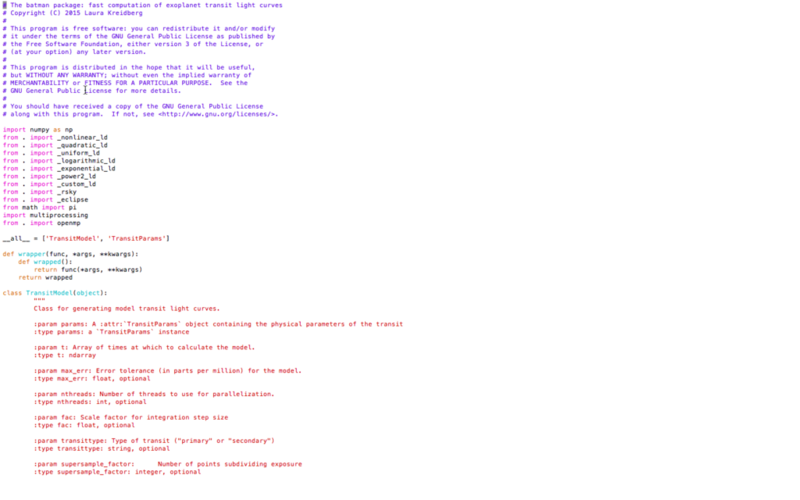 However, the methods to post code online (at least those I knew about) were pretty clunky. Nowadays, the infrastructure for posting and sharing code online is robust, mature, and relatively easy to use. Consequently, scientists are creating beautiful code repositories, along with accessible documentation. Open-sourcing code is becoming ever more important: as codes become more complex and capable, readily available codes with good documentation are critical to support reproducibility, a cornerstone of the scientific process. Moreover, federal funding agencies are starting to require investigators to make their code and data products public. Unfortunately, since I was one of the last generation of grad students before these repositories were common, I never really learned how to distribute and document code properly. So as part of an ongoing effort to improve my science output (and as an aide to my future students), I’m going to begin a series of semi-regular blog posts describing my process of learning how to write, document, and post scientific code. I intend to mostly (probably exclusively) write the code in python, which has become (at least in astronomy) the language of choice, so not all of what I write will be generally relevant. I was ushered into the Cult of Mac many years ago, so not all of what I write will be relevant for other OS’s. Here again, though, I’ve found anecdotally that most astronomers use Mac. This blog series is in no way intended to be comprehensive or rigorous. I’m just planning to describe what I learn as I go along, and what time I can devote will almost definitely not suffice to explain all the details, nuances, or technical aspects that intersect the project. As to the actual science code I intend to write, several years ago my colleagues and I wrote a paper about ellipsoidal variations induced by massive exoplanets orbiting very close to their host stars. The accompanying code, EVIL-MC was written in IDL, an older language still widely used in astronomy but proprietary and requiring the purchase of an expensive site license. My plan is to convert that IDL code into a Python package over the next several weeks. Posted in: Meetings. Tagged: LPSC, Mars, Pluto, Titan. I’m sitting in the hotel lobby at the Woodlands Marriott, waiting for my supershuttle to IAH and recouperating from my second Lunar and Planetary Sciences Conference, LPSC. Before I’m whisked away back to Boise, I thought to write about a few of the fascinating and mind-blowing things I saw this week. First of all, LPSC is an annual conference that focuses on the geology, geochemistry, and geophysics of planetary science. There’s a lot of focus on solar system bodies with solid surfaces, as opposed to the annual DPS meeting, which has a bit broader focus. I arrived on Sunday evening and dove immediately in, helping with the First-Timers’ presentation review, an opportunity for new-comers to the meeting to have more senior folks provide feedback on their posters or oral presentations. Monday dawned cloudy, and I sat through several talks about our sister planet Mars. One that stuck out for me was one about field experiments to explain the perennially mysterious gully formations found on martian slopes with sleds of dry ice. Tuesday saw me in a session on Saturn’s moon Titan, a cornucopia of geology and atmospheric physics. One particularly impressive talk discussed work to understand how methane deluges on Titan modified the surface. Tuesday evening, I presented our group’s work flying drones through active dust devils. Wednesday was packed with talks on sediment transport experiments and analyses, attempting to decipher the martian aeolian cycle, including a neat study of time-lapse imagery of martian dunes. Thursday was packed with Pluto and results from New Horizons. One talk that stuck in my mind was an analysis of landslides on Pluto’s moon Charon, which, frankly, was a little bit of a tear-jerker. Hard to believe that not one hundred years ago, we didn’t even know Pluto existed. Now we’re trying to understand the system’s geology. Friday morning wrapped up the meeting with a series of talks about glacial geology on Mars, including a fabulous presentation on mysterious geomorphic features on Mars. Even though these features look for all the world like glacial flow, they appear on totally flat ground, where flow shouldn’t be possible. And now to catch the shuttle. Posted in: Journal Club. Tagged: exoplanet, Kepler mission. Figure 1: The number of planets per star as a function of the planet-star mass ratio as discovered by Kepler. Dark and light blue curves are for stars less massive than the Sun, while the pink curve is for more massive stars. From Pascucci et al. (2018). Among the mind-blowing discoveries of the Kepler Mission is that the most common type of planet in the galaxy is the super-Earth/sub-Neptune. This unexpected type of planet straddles the boundary between Earth and Neptune in size and mass, and so they may be super-sized rocky planets or anemic gas-rich planets. We just can’t tell. Stranger still is that this bizarre chimera orbits one out of every four stars in the Milky Way, but we don’t seem to have one in our solar system (unless the Planet Nine hypothesis pans out). If that wasn’t enough to make you feel like a planetary outsider, a recent study suggests most planet systems have very different architectures from our own. In their paper, Prof. Ilaria Pascucci of the University of Arizona and her colleagues studied the distribution of masses for planets discovered by the Kepler Mission. Unlike other recent work, though, they considered not just the planet masses but how they compare to the masses of their parent stars. Naively, we might expect that more massive stars grow more massive planets, and there is good evidence that more massive stars host more massive dust disks. 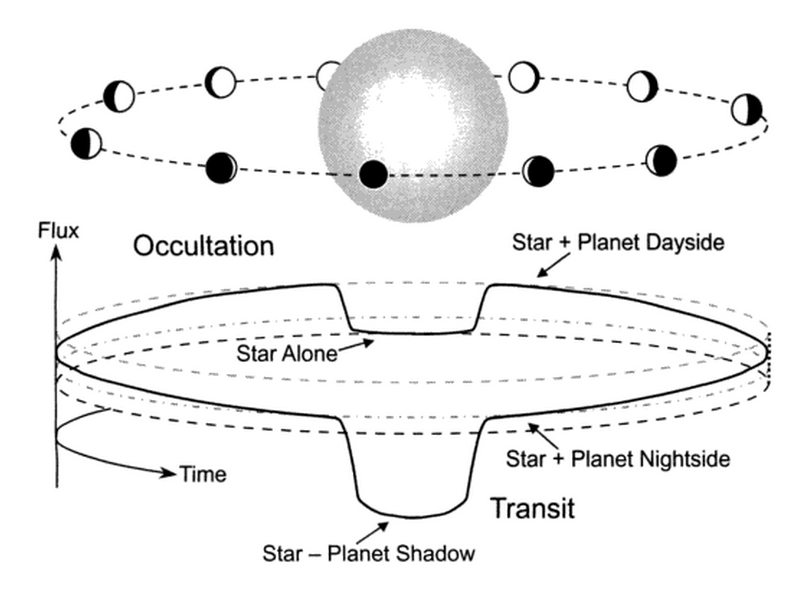 So as long as the processes that make planets are happy to operate around most any kind of star, then we can use the distribution of planet-star mass ratios to disentangle the influence of stellar mass from other effects. And Pascucci et al. found exactly what we expected – big stars, small stars, they are all more likely to host planets more massive than Earth — but only up to a point. 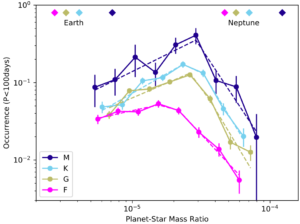 As shown in Figure 1, the number of planets per star increases with the planet-star mass ratio until it reaches about 0.00003 (or 10 Earth masses for one solar mass) — somewhere between the Earth and Neptune. Above that ratio, the occurrence rate drops, meaning more massive planets are less and less common. But something even more interesting emerged when Pascucci et al. compared their results based on the Kepler Mission to other surveys. Because Kepler is good at finding planets close to their host stars and not at finding planets farther away, Pascucci’s results don’t tell us much about planets in orbits like Jupiter’s. But microlensing surveys, which use a totally different planet-finding technique, *are* good at finding these more distant planets. 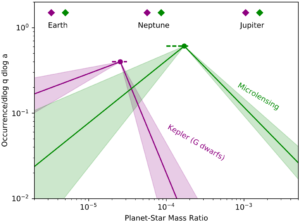 Figure 2: The number of planets around each star with a given planet-star mass ratio for planets close to their host star (as found by Kepler) and planets farther away (as found by microlensing surveys). From Pascucci et al. (2018). Comparing mass ratios from the two kinds of surveys, Pascucci et al. showed more distant planets found by microlensing also show a preference, but for a ratio several times larger than what’s preferred by closer-in planets — somewhere between Neptune and Jupiter in mass, as shown by the figure above. What does this all mean? Apparently, the universe seems to like make planets about ten thousand times less massive than their host stars, whether the stars are tiny red dwarfs or massive F-stars. And the farther away the planet is from its star, the more likely it is to be more massive. Standard planet formation theory predicts this trend: protoplanetary disks (from which planets form) have more solid, icy material farther from the host star, and more solids means more planet. 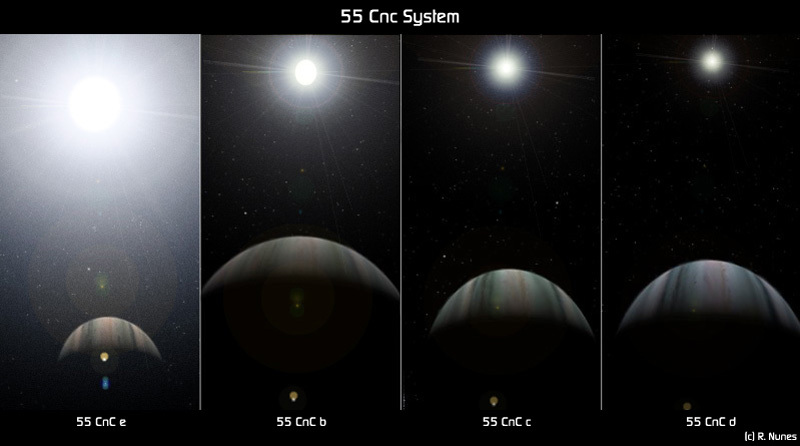 But these results also make our solar system look even stranger than before. In most solar systems, orbits like Earth’s (and closer) are occupied by planets somewhere between Earth and Neptune in mass, and more distant orbits like Jupiter’s are occupied by planets between Neptune and Jupiter. It’s tempting to speculate that things that make the solar system unique in one way (in this case, the type of planets we have) are related to other unique things (like, the fact that there’s life here). We don’t know much about super-Earths, but if they turn out to be more Neptune- than Earth-like, it’s not hard to imagine they wouldn’t be good places for life to get started. Life as we know it needs a planet with a solid surface and lots of liquid water, and so maybe it’s not surprising we haven’t found life elsewhere in the galaxy yet: most of the planets are lifeless, gas balls.